There is more to Atlanta's arts district than theatre and visual masterpieces alone. Midtown Atlanta is also home to some of the hottest restaurants in the city. Catch dinner and a show or swing over for a weekend brunch. 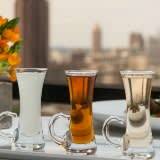 Sample the concoctions of Atlanta's favorite mixologists or indulge in decadent desserts. With a restaurant on every corner in Midtown Atlanta, this neighborhood menu can't be beat!